Exacting justice on behalf of her father comes at a steep price for Felicity Patterson. Now she’s the one being hunted by those seeking revenge. Help comes from an unlikely source but that offer of assistance is not without strings. 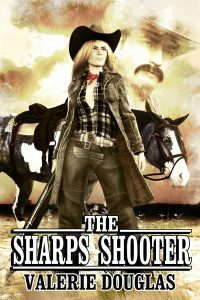 Tragedy forces Felicity to flee West, only to find herself in the path of a vicious gang of stagecoach robbers. Will her skills with her guns and a new ally be enough to survive, with enemies still seeking revenge on her trail? Valerie Douglas has written over 20 novels that reflect her eclectic tastes. A fan of almost every genre, she’s written the high fantasy Coming Storm series, Song of the Fairy Queen, and the Servant of the Gods historical fantasy series, as well as mystery, thrillers, westerns and romance. She writes books for adults with rich character and plot-driven stories.